With each new day comes a new operating system update, app, tablet release or new phone rumor that makes it increasingly more difficult to understand how anyone ever lived without being able to access the Internet anywhere, anytime. Worldwide, 1.2 billion people access the Internet through mobile phones or tablets and more than 58 percent of Americans own a smartphone. Now, more than ever, our smartphones are our lifelines – especially during the holiday season. Navigating the sales, short-lived deals and promos of the holiday season is a simple task with the help of a smartphone. Seventy-four percent of smartphone users shop on their phones and 79 percent of these people make purchases right from their phones or tablets. Marketers can take advantage of Black Friday, Cyber Monday and the entire sales cycle of the holiday season by using mobile marketing to its fullest potential. Check out these 4 ways to use mobile marketing to reach an increasingly larger mobile audience and boost sales. 1. 1. Optimize email marketing for mobile. When smartphone users are out and about, they want to check their emails for new deals or pull up discount bar codes and promotional details. If your emails are not already optimized for mobile, smartphone users will likely overlook it for emails that are already perfectly designed for their phones. Recent studies show that email ads created with responsive design garner 20 percent more clicks and conversions. 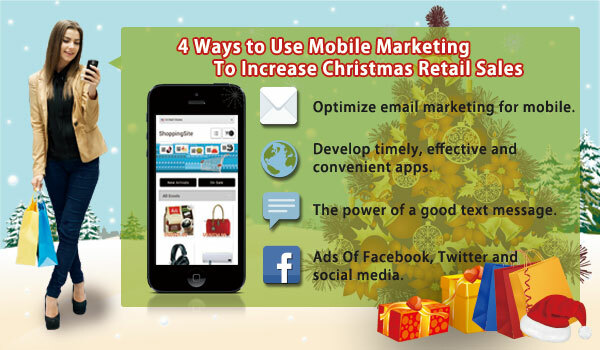 Mobile E-mail can not only attract customers on special holidays and enhance their desire to purchase, but also useful in everyday marketing. Providing customers with the best experience of browsing and interacting with customers are the goals that every company should pursue. 2. Develop timely, effective and convenient apps. Once upon a time, there was no such thing as Black Friday apps. Consumers would just wake up early, buy a newspaper for coupons, go shopping, come home and eat Thanksgiving leftovers. Nowadays, the sales start right at midnight, or even on Thanksgiving Day. Consumers chart out a course of attack on their smartphones by using Black Friday apps to find all the best deals, comparison shopping right from their phones and receiving real time alerts for new sales, deals and promotions. Any app that can help smartphone users easily and efficiently navigate Black Friday, Cyber Monday and holiday sales in general can help increase sales. 3. The power of a good text message. Even with apps, responsive design emails and more sophisticated types of mobile marketing, text message marketing isn’t dead. SMS marketing is efficient for smartphone and non-smartphone users alike. Plus, SMS messaging can promote existing mobile marketing campaigns with an immediacy that emails and apps can’t really offer. Studies show that 98 percent of SMS and MMS messages are viewed. Additionally, if consumers provide a location or email address, marketers can use that information to provide information about upcoming sales so they can deliver more relevant messages, offers and promotions in the future. 4. Facebook, Twitter and social media. Whether consumers are just browsing social media sites to stay entertained while waiting in line or they’re using social media to actively find sales, the advertising opportunities on Facebook and Twitter can help increase Christmas sales. Twitter’s promoted tweets and trends account for a 22 percent increase in brand conversation, 20 percent more brand mentions and 32 percent more retweets. Facebook ads can produce click through rates of 30 to 45 percent, depending on the brand. With a mobile marketing campaign, you can easily get the word about all of your best holidays sales, deals and promotions. Whether you’re a marketing veteran, have a few years of experience or you’re totally new, you can find tips, tricks and information to help you craft a holiday-friendly mobile campaign that will increase sales and bring in new customers.